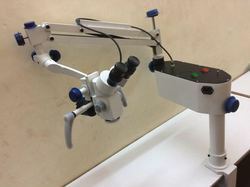 Exporter of a wide range of products which include table clamp microscope. Backed by our vast industry experience, we are engaged in manufacturing, exporting and supplying Portable Table Clamp Microscope for our valuable customers. This microscope is designed in tune with the industry standards using high-grade materials and sophisticated technology. Offered microscope is made available in several specifications. Looking for ENT Microscope ?